Many prescriptions drugs can cause alternate problems when trying to cure the original issue – a huge, well-known issue of prescription drugs. Now, a new study published in the journal Clinical Epidemiology adds to this notion, finding that statins, commonly prescribed to lower cholesterol, are associated with an increased risk of thyroid cancer in women. 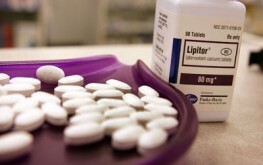 Researchers suggest that statins, when in the presence of a female dominant hormone called – a form of estrogen, become ineffective at exhibiting long term ‘cancer-protective properties’ as studies suggest they do. In fact, the drugs are linked to an increased chance of thyroid cancer in women. Yet another study published in the same journal suggests that the problem lies in the immunosuppressive properties of the statin drugs themselves. There are at least 25 different immuno-toxic properties of statins. You can view them all listed under the ‘Adverse Pharmacological Actions’ here. The stain industry is heavily invested in promoting their drugs. A single pharmaceutical company, Pfizer, has reported sales of $12.4 billion just for statins. So you can understand why they would not want this news to become widely spread, especially since they have promoted statins as anti-cancer agents. Statins are questionable in preventing prostate cancer. Statin use doubles risk of breast cancer (again). Possible increased risk of kidney cancer with statin use. Physiological studies using an animal model have also found statin-induced enhanced growth in the thyroid (thyroid hypertrophy), indicating its potential for contributing to thyroid cancer. Since this drug has already been linked to over 300 adverse effects, we shouldn’t be surprised that thyroid cancer is yet another to be added to the list. When will this insane preoccupation with the theory of statins end? There never was a study showing that cholesterol causes heart disease! So, what’s going on here? Can it really be that PROFIT perpetuates its promotion?